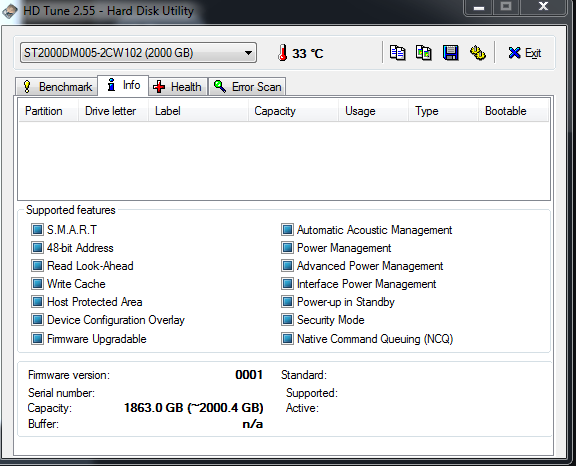 So I've bought a new HDD a week ago, 2Tb Seagate Barracuda 5400RPM/256Mb cache. Tested it with Victoria and other stuff right after the arrival, got nothing suspicious. Now I'm finally using it and... well, the speed is kinda strange. I'm trying to move files from my 2Tb Seagate Barracuda 7200RPM/64Mb cache to this new one, but shortly after the process starts, the speed lowers drastically to around ~35Mb/s. Is this... is this okay? I have a feeling that it's not. I thought that maybe my cables are outdated and somehow are SATA-1 (did not check them) but even then it's bandwidth is limited by 150Mb/s, not 35. Can you run hdtune benchmark on this drive? That would be normal only, if drive is being accessed constantly. What is installed on it? Did you run benchmark parallel with some copy process? Can you show HDtune health section also? Nothing is installed on it. I was going to replace my 7200 with this 5400 one as a file storage, no programs or anything. No, benchmark was running on its own, without any background processes. As for the Health section... strange, but it's completely empty. May be SMART monitoring is turned off on the port, where the drive is connected (it can be enabled/disabled in bios). Or may be it is connected to sata controller, that doesn't support SMART monitoring. Do your other drives show SMART? Yup, all of them. Also, previous HDD (the one that malfunctioned, hence the purchase of this new HDD) was connected to the same port, and there wasn't any problem viewing its SMART. Hmm, I have CrystalDiskInfo installed and from here I can see SMART. May be there's some issue with the sata port. 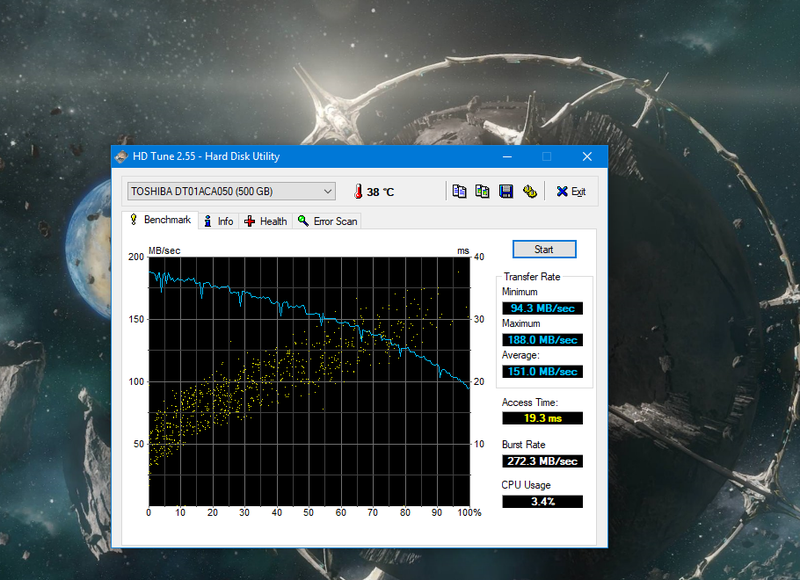 Try a different port and repeat hdtune benchmark. There is nothing wrong. A 5400rpm drive will be slower than a 7200rpm. 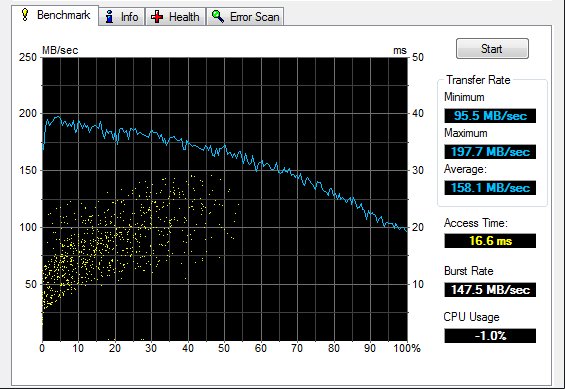 PS: Fast initial speed is due to caching (in the drive, in the OS). Such dips in performance benchmark line are not normal. 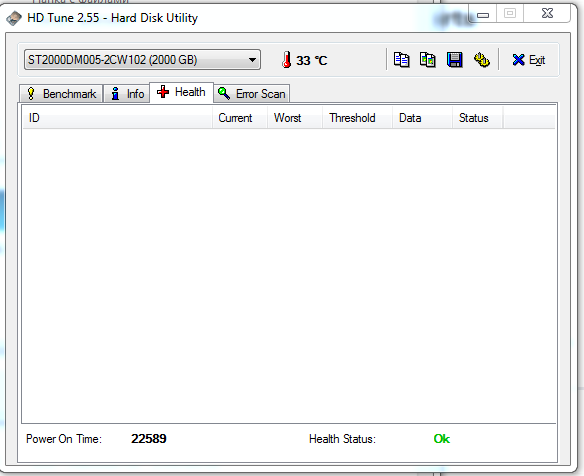 the drive is damaged/has unstable operation (SMART should show that, but it doesn't). It's exactly so. A 5400 drive will be slower than a 7200 one. No ifs or buts. Whatever else happens in that drive (re-calibrations?) is extra. 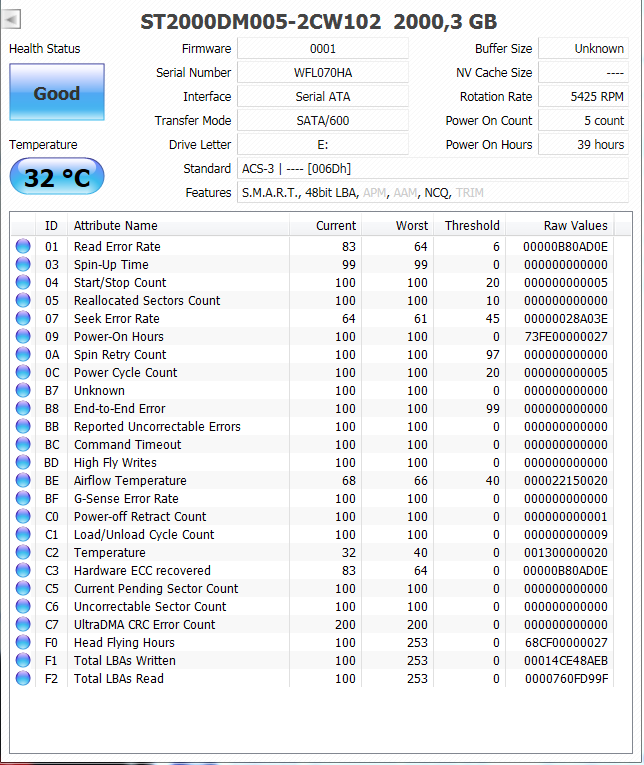 Some of the cheap 5400 drives can be fussy like that, you get what you pay for. Sorry for the prolonged response - New year and stuff, you know - and for the confusion. It seems that I did a mistake when tried to benchmarks HDD shortly (~5-15 minutes) after copying something from or to it. As for the low speed, I don't know actually. 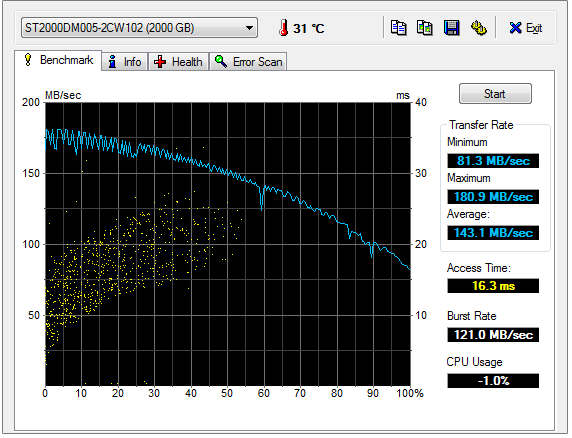 I've tested my other HDDs as well and 7200RPM ones experience the same problem when copying large amount of files. Average speed of writing under 'normal' circumstances (e.g. copying random game folder) is between 45 (sadly) and 80 Mbps for both 7200 and 5400 on my PC. As for the blank page in health and info sections, it is somehow an HD Tune issue - the Pro version and other applications don't have problems viewing this HDD's SMART. 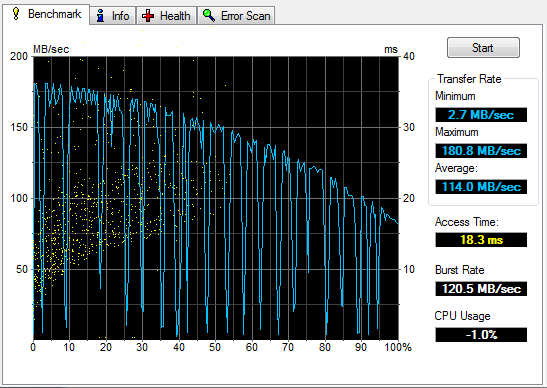 Maybe basic HD Tune doesn't like 256Mb cache, I don't know. P.S. One more thing about HD Tune. In his case the burst rate result is almost twice as high as my own. Is this because his HDD is less than 1Tb or what?